Going back to offering good gear salvage and omega mats would be nice. They just went 2 weeks offering incredible deals on Maul and QGJ shards at absurdly low prices. Perfect for shard shop for either gear or GG. Also this week has really good value Ewok shards if you're behind. Much better than the pack for example. Yes the maul and QGJ shards would be great for a new player. However, I'm talking about when it first started there was gear offered for credits that everyone needed. It was a great boost to the ridiculously long grind for that type of gear. I would take that and the omega mats over maul shards you can farm in the ship shop any day. And then there is this week what is this great value for ewok shards you mention because I'm not seeing it. The only one that is a decent value is the 5 ewok elder shards for 1 mil credits. The rest cost crystals. My original post is about how we used to get 3 great things just for credits and one great thing for ally tokens. It gave something the free to play player could look forward to each week. Now it's reduced to 1 mediocre item for credits and 1 mediocre item for ally shards. Maybe I am alone on this, but I never understood why it is such a big deal having the "extra 200 GW tokens". Sure it could be annoying, but that is literally it. It is not going to do anything but sit there, and maybe get used if they want to re-release the 100 GW tokens for shards. So what? It is just an annoyance. If you decide to waste a full run one day in order to get to full tokens, then be my guest and waste your run. But don't complain about it because it is your decision. Again, maybe I am alone, but I just don't see the big deal. Now to get this back on track, I am upset about the direction that weekly shipments seem to be taking, as they used to have really good items that were worth the credits/ally points (in my opinion), but now they are just worthless. Please make the items better CG! Also, why are these ewoks so high priced away and why is elder lower? Something is just wrong here. Newer content costs more crystals typically. But yeah we had a couple nice weeks there with GW for shop shard currency. This week is a joke. What about shipments? The pricing scheme is precisely the same regardless of how new a character is. So that point may not really hold ground. What about shipments? The pricing scheme is precisely the same regardless of how new a character is. Not true. Look at some of the older toons in the shipments. Example: In my store right now Shoretrooper is 320 for 4, Boba Fett is 200 for 4. Touche, but only seems to apply to shoretrooper for me too. Shoretrooper is on the high end, so I don't understand what you mean. Right now I've got the OR toons on the high end as well, also Sion, Bossk, Zombie, L3, Rose...Meanwhile I have Snowtrooper, Cody, Ewok Scout, Ugnaught, and Dathcha on the low end. The point I am trying to make is it still doesn't make sense. Shoretrooper was released on Oct 16th, Chirrut released in November a month later. Chirrut is low end, but shore is not. I thought maybe it was based off dates, but its making less sense looking at it that way. I totally get what you mean on the low vs high though. They changed Chaze to 50 and didn’t change Shore. People complained about that but it didn’t change. Then they stopped dropping characters to 50 ever again. I would also like to point out that if Chirrut or even Shoretrooper was low, then Chief Chirpa absolutely should be as well as he came out way earlier. This is not true for everyone. For example I had been stuck with 200 tokens since I was able to sim the galactic war. Every time I sim i would be left with 1400 total. This was due to an incomplete galactic war run sometime in my history. So getting the option to spend on him, helped me eliminate extra. You're correct. I meant the worst thing *for me* (and other players like me who were already at a multiple of 400). Thanks! No, next week will be the same as this week. Just like it always is. It runs in 2 week shifts. Note the theme, murderbears all over. It was 25 shards for 100 Galactic War tokens in the Weekly Shipments vs. 5 shards for 400 Galactic War tokens in the Galactic War Store. And it was the exact same setup for the shards purchased with Cantina Battles token in the Weekly Shipments vs. the Cantina Battles Store. So I don't know why you think it was the exact same price. It was 20x cheaper. 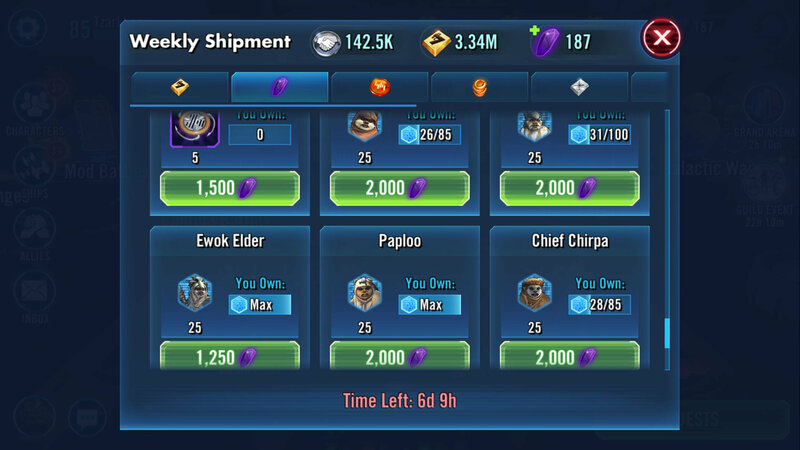 That was a response to the second part, about the "really good value on Ewok shards" this week. It's not a better value than the regular shipments, but it is a guaranteed 25 shards of whatever character you happen to need, which may or may not ever actually show up (or show up in the quantity you need) in the rotating crystal store.